As the Gujarat state assembly elections draw nearer, all eyes are set on whether the BJP, which won 47.9% of votes in the 2012 polls as against the Congress’ 38.9%, would be able to successfully keep intact this huge 9% gap in order to again resoundingly “win” a state for another five years, which is ruled by the party for the last more than two decades. The stakes are indeed high: The BJP’s only “poster boy” is Prime Minister Narendra Modi, who went on a desperate ribbon-cutting spree across Gujarat during a recent his two-day tour, followed by Congress vice-president Rahul Gandhi’s visit, which seemed to have drawn huge crowds in rural and semi-urban areas. Thanks to the relief to provided by the Election Commission of India, which appears to have decided to postpone imposition of the model code of conduct until at least October 25, not only has the BJP announced more sops, Modi is all set to address a major rally on Monday near Gandhinagar, with targets given to government officials and cops to mobilise around 10 lakh people. During his last visit, Modi, on whose image the BJP is heavily depending in the wake rising wave of anti-incumbency both in cities and rural areas, had gone in for a laying stone foundation ceremonies at various places – from Okha, the western tip of Saurashtra, to Bhadbhut Barrage over Narmada river in South Gujarat – even as addressing rallies and public meetings at half-a-dozen spots, including his hometown Vadnagar and capital Gandhinagar. In between, he “inaugurated” the construction of Greenfield airport off to make what he called “aviation affordable” even to those who wear chappals. Hitting out at the Congress, Modi had gone so far as to criticize former chief minister Madhavsinh Solanki, under whom the party a record number of in Gujarat, 149, for “front page advertisements” ahead of inauguration of a water tank in Jamnagar, immediately inviting criticism from the Congress on how he is fond of seeking publicity with pull page advertisements on every passing day. 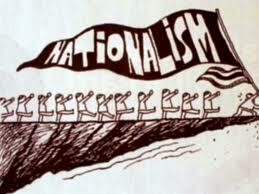 Critics say, Modi’s attack on a man who brought together OBCs, Dalits, minorities and tribals under his famous KHAM (Kshtriya, Harijan, Adivasi, Muslim) theory suggested that he was getting increasingly frustrated, as he found the BJP was losing support from sections which had previously backed the BJP, especially OBCs, Dalits and Patels. BJP chief Amit Shah’s target of crossing 149 seats of Solanki, whose son now is president of Gujarat Congress, seemed to him to have further dimmed. All this has happened, according to political circles, when the BJP’s efforts to woo other backward class (OBC) leader Alpesh Thakor, who has considerable influence among the numerically strong OBC Thakors of North Gujarat, are coming to a naught. 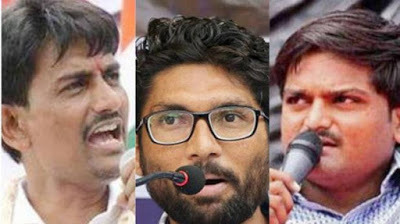 While Alpesh Thakor has still kept cards close to his chest, the first signs of Alpesh Thakor, who is leader of the OBC-SC-ST Ekta Manch and Thakor Kshatriya Sena, distancing from came when, last month, he declined to participate in the BJP-sponsored OBC at Phagvel village in Kheda district, even as deciding have his own rally. Subsequently, while his efforts to strike a deal with the BJP further flopped, political around him confirmed, he has begun negotiating with the Congress. 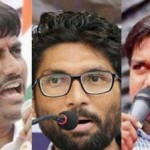 That Thakor has distanced himself from the BJP seemed further clear when Gujarat chief minister Vijay Rupani dared him to contest elections to get the “real measure of their popularity.” Rupani threw a similar challenge to the other two youth non-party leaders with considerable influence among their respective communities, Patidar quota leader Hardik Patel and Dalit leader Jignesh Mevani. Being seen as a victim of state repression – he has had to face long jail terms and court cases for certain utterances in public rally which the authorities termed “seditious” – Hardik Patel spontaneously attracts huge crowds wherever he goes in Gujarat. Even as Mevani, on his part, has going around in villages and towns, taking pledges from Dalits not to vote for the BJP, the state’s Dalits are becoming increasingly restive following the murder of a 21-year old Dalit youth in Bhadraniya village in Anand district for sitting at a distance and watching Dussehra garba. The incident came amidst uproar among Dalits, as two youths of Limbodara village of Gandhinagar district were attacked on two separate days for sporting mustaches similar to those of upper caste Rajputs. Sounding caution over the incidents, Martin Macwan, one of the senior-most Dalit activists of Gujarat, says, these developments are taking place at a time when such tactics like the BJP leaders directly asking Rahul Gandhi to declare whether he is a Hindu or a Christian are not working, because Gandhi, for a change, this time has been visiting temples and seeking blessings of the priests. 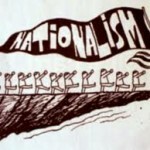 Further, the past animosity between Dalits, Patidars and OBCs, who represent 7%, 12% and 50% of Gujarat’s population respectively, is fast fading. Macwan notes, after so many years, one witnessed a new development in village Bhadraniya, where the young boy was killed for watching garba. The OBC Thakor community was part of the burial procession, and it also helped cremate and prepare the funeral pyre. Melbourne, 17 June: The national spokesperson of the Bharatiya Janata Party (BJP), Dr. Sambit Patra today came down heavily on the NDTV describing it as “anti-India, anti-Hindu & anti-BJP. Dr.Patra who is touring Australian cities to celebrate the Modi-led NDA government’s three years in power was answering to Melbourne-based SAT (South Asia Times) question about the NDTV episode where he alleged NDTV ‘agenda’ and was asked to leave the live discussion by the anchor. 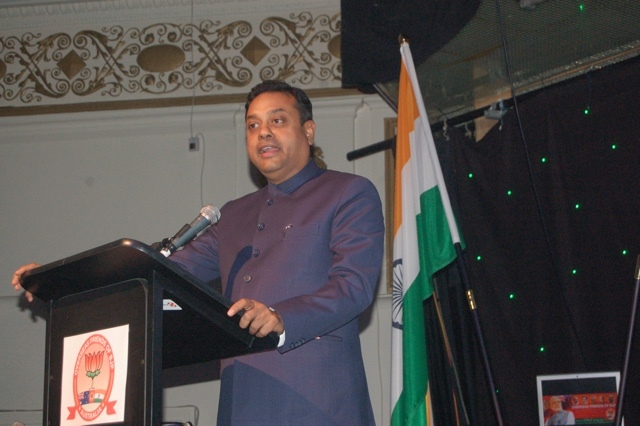 Earlier, Dr. Patra gave a half-hour speech on the achievements of the three years of Modi government in a program organized by the Overseas Friends of BJP (OFBJP) Australia at the Thornbury Theatre here. Dr. Patra addressing the gathering on the ‘ABCD of achievements’ described the demonetization step as one that touched every section of Indian society in its aim to weed out unaccounted money in the country. He then detailed other Modi government programs of rural electrification, girl’s education, ease of doing business, infrastructure development among others. The BJP leader said India has now arrived on the global scene and it is the Indian civilization based on the Vedic culture that was engulfing the world. The gathering was also addressed by the OFBJP leaders and political leaders including Gevin Jennings (ALP) Indian Counsel in Melbourne Manika Jain and Inga Peulich (Liberal). A Q-A session scheduled after Dr. Patra’s speech was canceled.